The Spanish Inquisition is often seen as the archetype of religious fervour and fanaticism, and several of the papers here naturally focus on its activities. 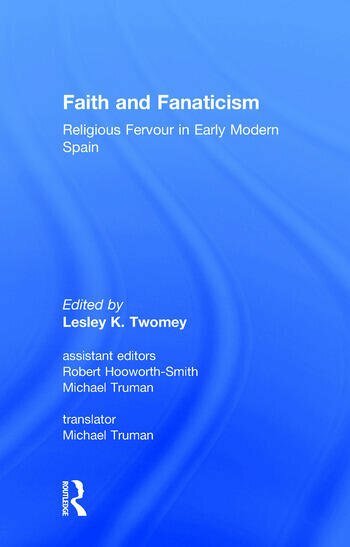 Overall, however, this volume aims to look at the broader context of religious attitudes in Spain, from the end of the 15th to the late 17th century. In an examination of how the religious orders behaved, the contributors demonstrate that concepts which may now appear excessive were perceived at that time. Similarly, poetry and other literary texts provide evidence for how Jews viewed Christians and Christians viewed Moors. Contents: Introduction; John Edwards; Part 1: The Quest for Orthodoxy: Fervor / Fanatismo or Entorno /Enfoque: The Problem of the Female Visionary in the Catholic Monarchy, Ronald Cueto; ’Cechs sÃ³n aquells que tenen lo contrari’: Fanatical Condemnation of Opponents of the Immaculate Conception in 15th-century Valencia, Lesley K. Twomey; Meditation and Contemplation: Monastic Spirituality in early 16th-century Spain, Terrence O’Reilly; Part II: The Imposition of Orthodoxy: Spain’s Little-Known ’Noble Army of Martyrs’ and the Black Legend, A.Gordon Kinder; Did Spanish Crypto-Jews desecrate Christian Sacred Images and why? : the case of the Cristo de la Paciencia (1629-32), the Romance of 1717 and the events of November 1714 in the Calle del Lobo, Michael Alpert; Popular Religious Scepticism and Idiosyncrasy in Post-Tridentine Cuenca, Nicholas Griffiths; Part III: Cross-cultural awareness: The Religious Background of the Sephardic Ballad, Hilary Pomeroy; A Comparison of the Devotional Systems in the Viaje de TurquÃ­a, EncarnaciÃ³n SÃ¡nchez GarcÃ­a; Fervor sin fanatismo: Pedro de Valencia’s treatise on the Moriscos, John A. Jones; Index.